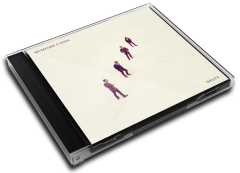 Delta is the fourth studio album by British band Mumford & Sons. It was released on 16 November 2018 through Gentlemen of the Road and Island Records. The album was recorded at The Church Studios in London with producer Paul Epworth. The album is supported by the lead single, "Guiding Light", which was premiered on 20 September 2018 on BBC Radio 1. It will also be supported by a 60-date world tour to begin in November 2018. The band recorded more than 25 songs with Paul Epworth at The Church Studios, and were intent on keeping the "collaborative spirit" of their live shows and 2016 EP Johannesburg. Marcus Mumford has said that much of the album was recorded in "non-gender specific Friday night lads sessions" with friends where they would play music, "smoke cigarettes and have a great time". Around 100 people were involved in these sessions, with some being featured on the record, including American singer-songwriters Maggie Rogers and Gill Landry. Delta has been called an album that "draw on the shared experience of being on and off" tour, and distinct from the band's "anthemic" previous album, 2015's Wilder Mind, in that it is more "tender", "introspective and reflective". It will incorporate elements of electronica, rap and jazz. It has been said to still contain the "intimacy and jubilance" that the band is known for, but keyboard player Ben Lovett said it is also concerned with "the four Ds: death, divorce, drugs and depression". Marcus Mumford spoke to Annie Mac about reusing folk instruments they did not use on Wilder Mind but being "conscious how we can make these instruments sound not like these instruments which opened up a whole new world for us".